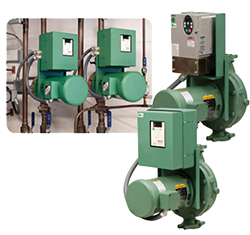 Let the 1900 VFD operate your buildings with greater efficiency; using them to control your pumps can significantly reduce energy costs. Most HVAC systems are designed to keep the building cool on the hottest days and warm on the coldest days. Therefore, the HVAC system only needs to work at full capacity on the 10 or so hottest days and the 10 or so coldest days of the year. On the other 345 days, the HVAC system may operate at a reduced capacity. This is where a system with variable frequency drives (VFDs) can be used to match system flow to actual heating and cooling demands. The VFD can reduce the motor speed when full flow is not required, thereby reducing the power required and the electrical energy used.